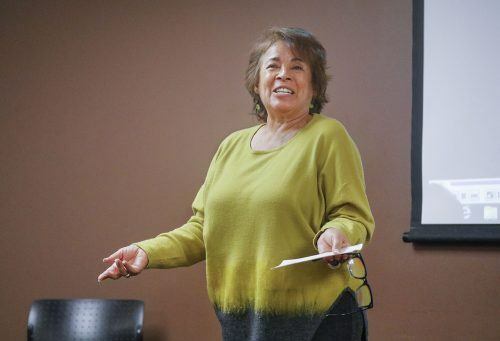 After facing sexual harassment and discrimination in her own professional life, Alma Martinez, associate professor of theater arts, and professional actress, is tackling the depiction of Latinx people in mainstream media. The lecture filled the President’s Dining Room with students, staff and faculty who were interested in the topic. Martinez opened her lecture with a personal story about her experience with sexual assault during the filming of “Barbarossa” in 1980. The 1982 film starred Willie Nelson, Gary Busey and Isela Vega. Martinez said that her harassment began the moment that she set foot on set. Martinez said she was asked by a “producer, actor, star” of the film to rehearse lines. After agreeing, the man said that his driver would pick her up and bring her to his hotel for rehearsal. Martinez asked to rehearse during the day. The man, whom she did not name, insisted on meeting at night. The next evening, they knocked at Martinez’s door. The next day, Martinez was asked why she had not responded to the knock. She repeated that she was not comfortable going to the man’s place at night. Martinez finally gave in and agreed to go to the man’s cabin, where she was met by many colleagues who were involved in “Barbarossa’s” production. Eventually, the man told Martinez to follow her into his room to rehearse. Once they were in the room, Martinez began flipping through her script and asking which scene he would like to rehearse. At that point, she said, the man pulled out a guitar and began strumming it on the bed. “You know, I fell in love with a Latina in my last film,” he’d told her, Martinez recalled. Martinez said after that she grabbed the man and pushed him against the wall, and shared “a few choice words” with him. “I’ve never ever done this in my life before; I have not done it since, because now I know the signs,” Martinez said. She left the man’s room in the hotel, and was greeted by a two-mile road with no lights that led back to the film’s camp. She said that phrase, “Mexican women are all the same,” stuck with her and has helped motivate her to study the depiction of Latinx people in film. Martinez reminded her audience Tuesday that the representation of people of color in film has nothing to do with the quality of the actors portraying those roles. Martinez said that it is important to consider what she refers to as the gaze, or the perspective, of the person who is telling the story. The problem is that the heroes are very rarely people of color, she said. This fuels the stereotyping of people of color in society. In response to the idea that stereotypes are based on truth, Martinez said that all stereotypes have historical antecedents, which derive from the appropriation of non-white culture. Martinez references Emiliano Zapata, a leading figure in the Mexican Revolution. Zapata’s long mustache and large hat have become a popular symbol for Mexican culture in America, despite the fact that very few even know who the look represents. Zapata’s image is applied to products from companies looking to market their commodities with the allure or exotic nature associated to the culture. “I always feel like we have white people in charge,” said Clarissa Perez, junior sociology major. “They are the ones who make the stereotypes. They can depict whatever they want,” she said. Martinez said that Hollywood and media have historically categorized Latino actors into very specific, stereotypical niches. One of those niches for men is the “bandidos,” who all have a certain outfit that is attributed to Latinos, a heavy Spanish accent, gruff voice and appearance and usually portrayed to have below average intelligence. The female equivalent of this stereotype is what Martinez refers to as “spitfires,” in honor of actress Lupe Vélez, who starred in many films as a hot-tempered and lustful woman. Whenever a character Vélez was playing would become angry, she would speak very quickly, alternating back and forth between English and Spanish. Martinez compared Vélez to more modern actresses like Salma Hayek and Sofia Vergara, who portray many of the same characteristics. Martinez also faced difficulty as a Latina during her education at the University of Southern California. Martinez attributed her difficulties to the differences between the expectations of her in high school vs. her college. The culture of the college diminished Martinez confidence, she said. “I found myself always sort of cowering at the back of the class because I never felt like I was part of the institution,” Martinez said. She did ultimately finish her education at Whittier College. She then earned her master of fine arts degree in acting at the University of Southern California, and her doctorate in directing and dramatic criticism at Stanford University. Martinez said that schools now have a much better approach to students who are facing these struggles.